Major Sediment Runoff Affecting Chesapeake Bay – How Much From Drilling? 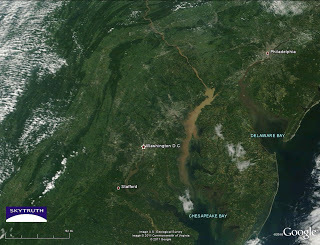 MODIS/ Terra image taken September 12, 2011, showing sediment-laden runoff (pale brown) from the Susquehanna River filling the upper reaches of the Chesapeake Bay. This runoff consists of sewage overflows and sediment and other contamination washing off farmer’s fields, construction sites, and impervious surfaces like roads, parking lots and rooftops. It’s a big shot of bad news for aquatic critters and the stuff we like to eat from the Bay – oysters, rockfish and crabs – and it’s not too great either for the communities along the way that get their drinking water from these rivers and streams. One of our concerns is that one-third of the Bay watershed lies on top of the Marcellus Shale drilling play, and we expect tens of thousands of new construction sites in the area over the next several years as companies clear land to drill wells, install pipelines, and build support facilities. 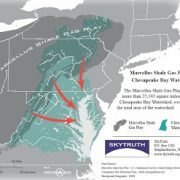 These sites represent potential new sources of runoff and surface water contamination, and given the precarious state of health of the Bay,we think this potential needs to be seriously evaluated and, if necessary, mitigated and better regulated to ensure the Bay doesn’t suffer as this gas resource is developed. 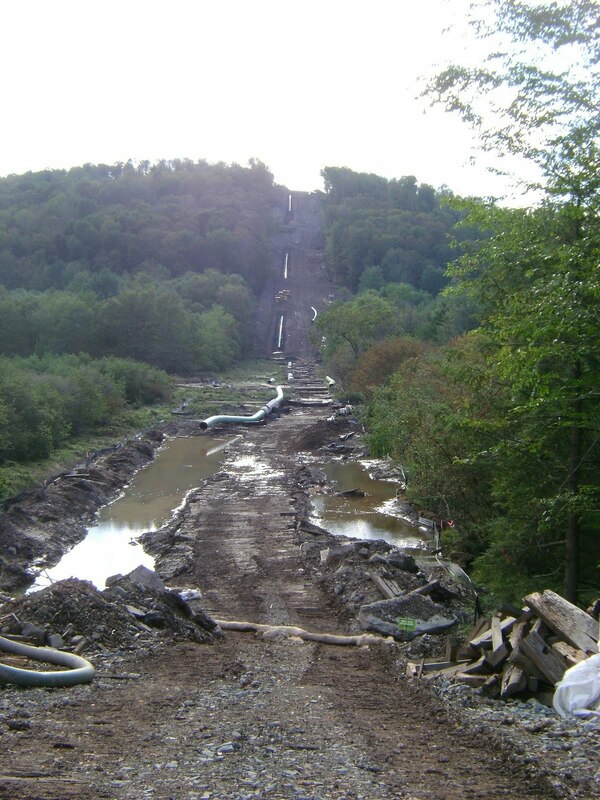 Erosion along new gas pipeline right-of-way in the Chesapeake Bay watershed (Susquehanna River basin), north-central Pennsylvania. Photo taken by SkyTruth intern Ben Pelto on September 10, 2011. We’re also starting to see disturbing but unsurprising pictures of flooded drilling sites and beat-up, pushed-around pieces of equipment like the tanks that hold drilling mud and fracking fluid. 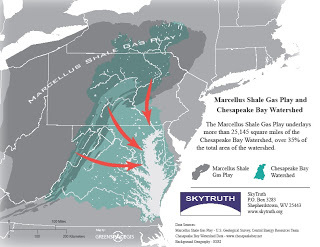 That’s because, unbelievably, most states allow industry to drill in high-risk floodplains. Our friends at LightHawk are flying over the areas affected by flooding, including the Wysox Creek watershed where we collected water quality measurements earlier this summer. When their aerial pics become available we’ll share them here, along with more from Ben’s trip this weekend. UPDATE 9/16: see aerial pics of flooding, Marcellus Shale drilling sites, and pipeline construction (and a few beauty shots!) 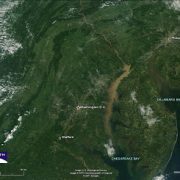 in the upper Susquehanna basin taken by J Henry Fair during a LightHawk overflight on Monday, September 12.
https://skytruth.org/wp-content/uploads/2011/09/SkyTruth-12sep11-MODIS-Terra-runoff-NE.jpg 245 320 John Amos /wp-content/uploads/2016/08/test_logo.png John Amos2011-09-13 18:08:002019-02-22 11:23:27Major Sediment Runoff Affecting Chesapeake Bay - How Much From Drilling?